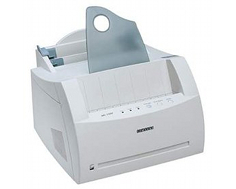 The Samsung ML-1430 is a monochrome laser printer that was sold during a time when manufacturers were attempting to market laser printers for personal home use, offering decent quality and somewhat affordable prices. Built on the simplest of designs, this printer had a straight-through paper feed mechanism that was relatively inexpensive to manufacture and, as a result, quite susceptible to quality issues and random malfunctions. Samsung was successful in offering a cheaply-built, cheaply-priced printing solution to the public that was suitable for only the most basic of home printing needs. Part of the inexpensive, economical design included a very small dimensional footprint of 13 x 13.9 x 9 in. and a weight of only 13.7 pounds, allowing the home user a printing solution that would take up as little space as possible and fit on any table, desk or appliance cart. Print speeds for this model were at a maximum of 15 pages per minute at minimal quality. The maximum attainable print resolution was 600 x 600 dots per inch and print quality was minimally enhanced by the manufacturer's patented Samsung Printer Language. The Samsung ML-1430 featured a 66 MHz processor and 8 MB of page RAM, capable of handling text document printing and some very basic graphic image printing. Media types supported included envelopes, plain paper, transparencies, card stock and labels. The maximum media size that could be accommodated was 8.5 x 14 in. legal size. Both European and American letter sizes were supported, as well as many different sizes of envelopes. The paper input tray held a total of 150 sheets of plain paper at an average 20 pound weight and a media feeder was capable of loading many types of paper and card stocks. The rated monthly duty cycle for this unit was 12,000 pages, targeting this printer specifically to small volume personal use and possibly some limited home office use. Connection interface types that were built in included a uni-directional parallel port and a USB port, allowing direct connection to computers with then-new USB technology. Power consumption was at an average of 250 Watts when fully operational and 10 Watts when in standby/sleep mode. Operating system compatibility included support for client OS's up to Windows XP and network server OS's up to Windows NT. Many types and builds of Linux were also accommodated. The cheaply designed straight-through print mechanism was prone to paper skewing and jams, as well as smudged print results. Print speeds were extremely low for comparable units and the maximum print resolution was barely enough to provide decent quality text document prints that were suited for basic personal needs such as school assignments and letters to family and friends, which could be done with better speed, convenience and quality with popular types of ink jet printers that were manufactured at that time. Built in connection interfaces were limited and one of the two types provided is now considered obsolete. Paper pickup rollers were known to fail within one year of use, making the automatic page feeder inoperable. First page times often exceeded 30 seconds, which was quite slow for laser printers at that time. The printing mechanism was very loud and often failed when printing envelopes. With no Ethernet networking capabilities available, this printer could not be connected to a hub or router and had to be shared by utilizing print sharing utilities that come standard with Windows. 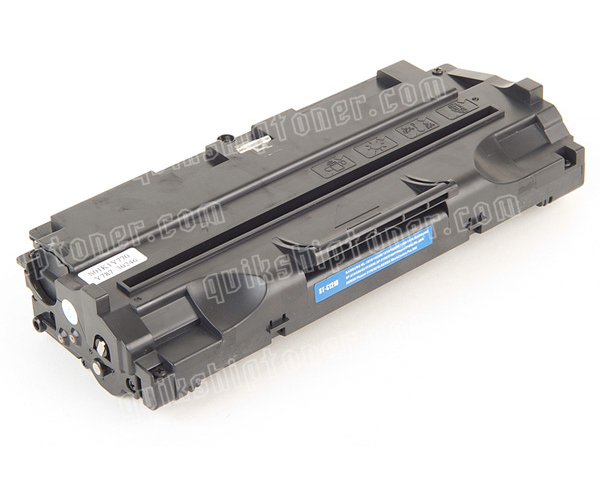 Review it: "Samsung ML-1430 "
The Samsung ML-1430 came with one black starter toner cartridge with an average yield capacity of 1,000 pages at 5% coverage. Replacement toner cartridges can be purchased with a higher yield capacity that averages 2,500 pages at the standard 5% coverage. 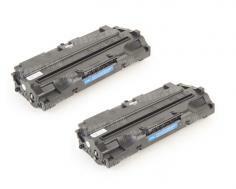 The average price of toner cartridges keeps toner costs low, at an average of 1.5 to 2 cents per page. ML-1430 (ML1430) 2Pack of Toner Cartridges - 2,500 Pages Ea.